Crafted from 100-percent abaca leaf — an extra soft and durable leaf artisans used centuries ago in Japan to protect their gold and then adopted by the geisha to remove excess oil without disturbing their makeup — Tatcha's biodegradable, gold-flecked blotting leaflets are perfect for absorbing excess sebum and come in a super-slim case that can be tucked into your clutch, no sweat. 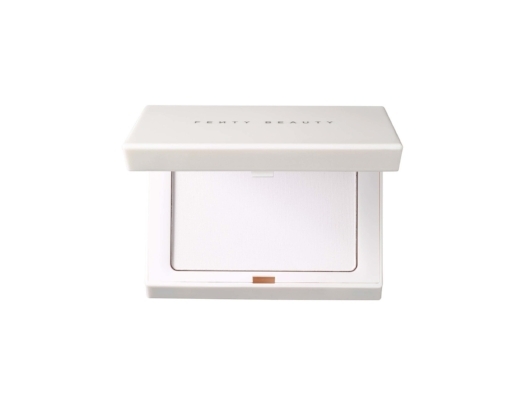 Rihanna-approved, this translucent blotting powder is formulated with a pore-diffusing complex to reduce shine and provide a natural-looking matte finish. Without leaving residue, it works with all skin tones and comes in a chic, mirrored compact. Washable and reusable, the Blotterazzi Pro from Beautyblender is an open-cell structured sponge designed to absorb oil and smooth the skin. Used dry, its shape allows you to reach the contours of your eyes and nose with ease. A great alternative to traditional blotting papers, it comes in a little case perfect for toting. Coated with an anti-bacterial skincare powder to reveal smooth skin and formulated with the mineral hydroxylapatite to selectively absorb harmful lipids, Shiseido’s Oil-Control Blotting Papers remove unwanted shine and absorb excess sebum in a snap. Topped with a triangular shaped tip to reach each crease and curve of your face, Benefit’s blotting stick is formulated to mattify shine for up to six hours. Perfect for touch-ups, simply apply to desired areas with short strokes.